Catalan architect-engineer genius Antoni Gaudi has been dead a century. Most of his intricate models and drawings for Barcelona’s Basilica i Temple Expiatori de la Sagrada Familia went up in flames generations ago. Despite it’s causal connection to the fire, anarcho-syndicalism awaits meaningful rediscovery. Spanish Fascism’s long run is thankfully finished. Today’s Catalonia is one of the more successful parts of the troubled Kingdom of Spain (Yep, that’s the name). 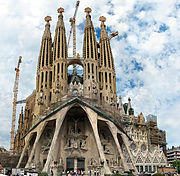 Design critics have called for a halt in the construction of the Sagrada Familia for decades; it has been misidentified as a massive endeavor in religious kitsch (admittedly, redundant), a failed approximation of Antoni Gaudi’s original vision, or simply an ostentatious white elephant obstructing the true message of the Gospels. Architecture is not frozen, people-less, or the construction of poetic ruins (Vatican City, anyone?). A massive church neither prevents nor promotes genuine Christian ministry. Progressive architecture proves little –look at Brasilia under the 1964-1985 Brazilian dictatorship! Modernism and narcissism need not walk hand in hand. “The Expiatory* church of La Sagrada Familia is made by the people and is mirrored in them. It is a work that is in the hands of God and the will of the people”. Not less than one of the two have valiantly labored on. Spanish anarchists did their best to destroy this oddly progressive living symbol of deeply regressive and cynical Spanish Catholicism (Franco and legions of murdering priests). A complex building that evolves is often better then one fully planned before the first foundation has been prepared. Barcelona’s Sagrada Familia is no exception. Generations of worker artisans –under wise leadership– remain deeply committed to completing Gaudi’s vision. There are faithful of many sorts who welcome the same. This entry was posted in architectural practice, art & design, Art Nouveau architecture and tagged architect Rudolf Steiner, Catalan art nouveau, Catalonia, Catalonia architect Antoni Gaudi, Catalonian art nouveau, Das Goetheanum, Ozenfant, Perriand, Pierre Jeanneret, Sagrada Familia Church, Sagrada Familia controversy, Sagrada Familia news on October 3, 2014 by Steven S Dornbusch.